Burnsville Mayor Elizabeth Kautz, who has attended global climate talks, said cities are moving forward on climate change much faster than nations. She recalled the disappointment everyone felt in 2009 in Copenhagen, when world leaders failed to reach any kind of agreement to address climate change. "Well, nothing happened in Denmark," she said, "but something happened with cities. Cities were making a difference. Cities had plans, and cities were working those plans. And we continue to do that." 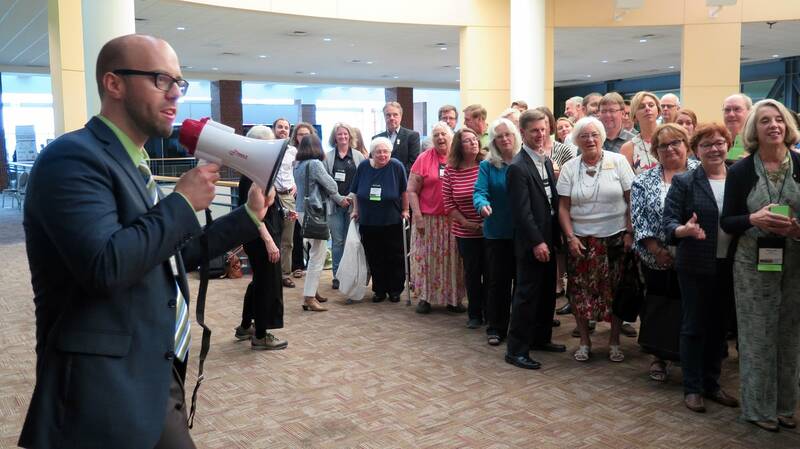 Kautz was among those who spoke at the Minnesota League of Cities annual conference in St. Paul this week. Burnsville and five other cities have reached the highest level of environmental stewardship in the state GreenStep Cities program, which began in 2010 to recognize sustainability efforts. More than 100 cities representing 40 percent of Minnesota's population are now part of the GreenStep program, which recently added a category for cities that are finding ways to be resilient in the face of climate change. It's not just the well-off suburbs participating in the program -- much smaller cities all over the state are also making sustainability a priority. Hutchinson, a city of about 14,000 people located about 60 miles west of the Twin Cities, has reached the same level in the GreenStep Cities program as Burnsville. On a tour of the city, Hutchinson's environmental manager John Paulson pointed out their composting facility. The city has curbside pickup for yard waste and food scraps, and has offered the program for residents since 2003. Meanwhile, Minneapolis is still distributing carts for its curbside organics program. Paulson had so many things on the list of city sustainability projects that he had to pick and choose what to show off. 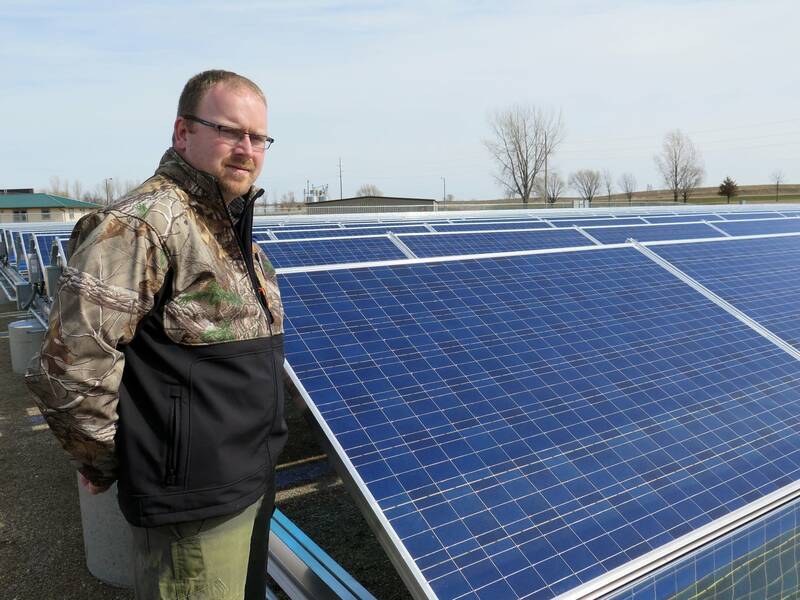 One of the city's latest projects was the installation of a solar array next to the city's wastewater treatment plant to offset some of the electricity the energy hog uses each day. 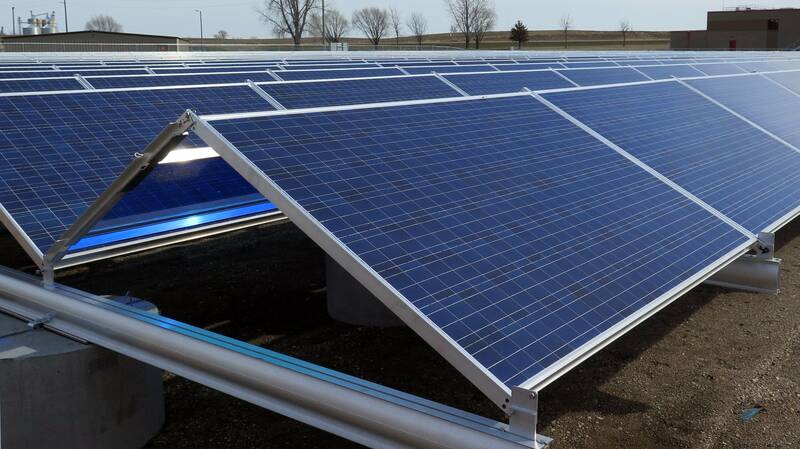 The city got help from Xcel Energy to build the solar array, which produces on average 12 percent of the power needed to run the treatment plant. Plus, Paulson said, they're quiet and take very little maintenance. "During some of the snowfalls we had during the course of the winter, if the conditions were right and we got a 4-6" snowfall, by the end of the day these panels were shed. The snow had just sloughed off, we didn't have to broom them or rake them." Two hours northwest of Hutchinson, Morris City Manager Blaine Hill has an office in City Hall, which once housed a gas company. "We recycled it into a city hall, and it's functional," he said. Morris hasn't filled out the paperwork to become an official GreenStep city, but there are plenty of sustainability projects -- from LED lighting to stormwater management -- that Hill said have ultimately saved the city money. Now, the city is looking into adding solar. Meanwhile, Hill and other representatives from Morris hope to get even more ideas when they visit North Rhine-Westphalia in Germany next month as part of climate-smart exchange program between Minnesota and Germany. "If it makes sense to invest money to save money and be sustainable and be green, then we'll do that," he said.